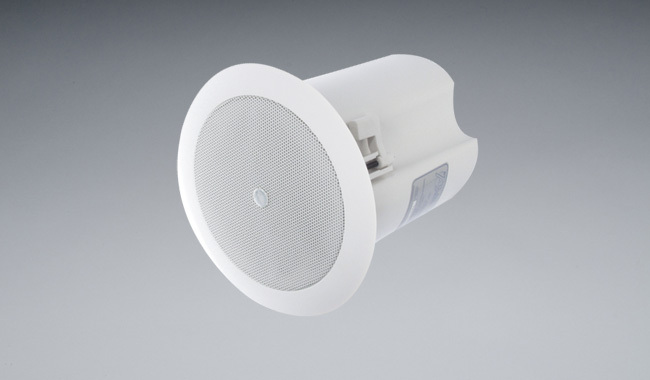 CTG has selected the Atlas Sound FAP 40T 4” speaker as a recommended flush mount ceiling speaker for its system. This unit was found to be excellent in replicating voice and its dispersion angle makes it a good partner with the CTG ceiling microphone. The unit comes with a tile bridge for added stability and has a bright white grille that matches contemporary architecture. Designed to provide high performance in a very compact footprint, the FAP40T appeals to both system designers and architects. FAP40T is ideal for high-intelligibility voice, music, and signal reproduction in commercial, industrial, and institutional applications. A unique (patent pending) tap selector switch design allows for easy system tuning. A full selection of taps up to 16 watts as well as an 8 ohm transformer bypass setting is included for maximum system versatility. This switch “knob” also functions as a diffuser cone, providing smooth, even dispersion of the high frequency content from the center of the 4″ polypropylene driver. In fact, the high frequency response of the FAP40T is so natural that many would assume that the driver in the FAP40T was a coaxial design instead of a single cone driver. Low frequency response is enhanced by the tuned and ported enclosure design. The enclosure (UL1480 pending) is constructed of high impact injection molded plastic and includes a press fit grill design that blends quite well with contemporary architecture. A two pole terminal strip housed below a metal removable cover on the back of the FAP40T enclosure allows for easy system wiring as well as “daisy chain” wiring to other FAP40T’s or even FASUB70 subwoofers (a great combination! ).